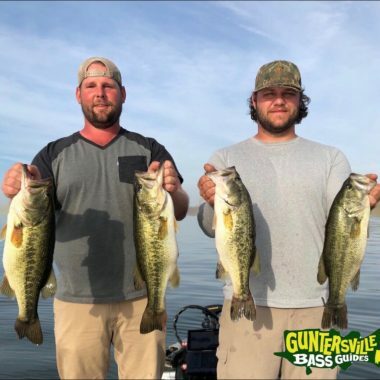 Jim and Guntersville Bass Guides are the best!. My son and I went out and had a blast. 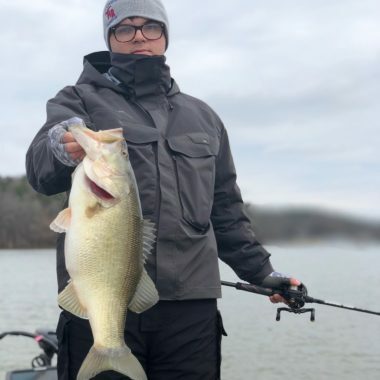 My son Carter, 16, has much more experience and was on the fish right away. Capt Jim took some time with me... read more and was very patient but also very intent on making sure I was on. Writing this review right after getting home from the guided trip. Tough bite is the two words that describe the first few hours of the trip. 4lber first cast, a few more over the next 40 ish minutes, then the... read more bite went away. Capt. Jim did everything he could to make sure we were back on the fish, and it worked. Caught a total of about 23 fish with a 5 fish bag of 22 lbs and some change. Kicker fish was 6.6. Jim is very knowledgeable and willing to help you whenever. He knows his stuff and is willing to share everything you need to know (unless you just browse his page looking for spots). If I had to come up with something negative it would’ve been out of his control any way and that would have been the wind. I say that, but even with the wind the fish were biting. Jim has a great attitude, good advice, good spots, good rods reels etc., good boat, and a good dog. Belle (the dog) did make a stage dive towards the end but it all turned out well. I had a fantastic time and will do my best to make it back with Jim someday hopefully soon! An Unforgettable Day ! 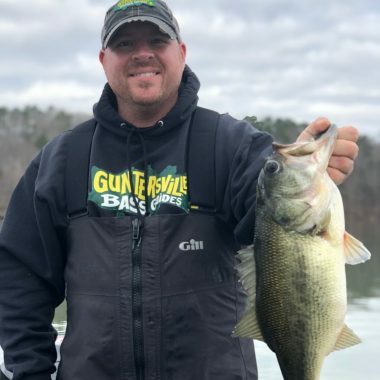 My wife booked an evening trip for me for my birthday on Lake Guntersville will Jim Leary. I had never been to G-Ville and did not know what to expect. After meeting Jim at the ramp... read more and seeing some pictures from his morning trip, I was pumped. We took off and made it to our first and only spot and it was on. 25 + fish . We kept 15 of our biggest to weigh. The small 5 was around 17lbs. Our middle 5 was 25lbs and our biggest 5 was 35lbs. Wow ! Truly a trip of a lifetime. It was so good that i changed my plans and went back out the next morning, although the bite slowed down from a cold front, we still had our best 5 go 23lbs. G-Ville is definitely on right now. I have fished with Jim for several years now and have been absolutely blown away each time. I have always caught fish, even in the worst conditions, and have never felt let down at all. Even when the wind chill... read more is single digits and waves are white capping he provides the best service possible and yes I have fished with him multiple times like this. 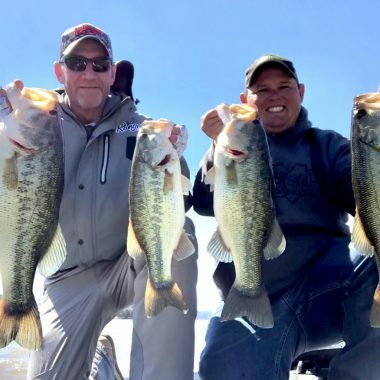 (It is actually pleasant as there will only be one or two other boats on the lake)I most recently went fishing late February 2018 due to a cancelation he had (last minute). Boy did I pick a good time. I scheduled 2 consecutive days and the fishing was so great we spent 23 hours on the water in these two days. My family sent messages thinking I was injured or lost we were gone so much. 50+ keepers, several large bass over 5 pounds, many 4 pounders, and got to the point that I was calling 3 pounders babies! Once again, and for several years now, I left a deposit for my next trip that isn't even planned yet. I know when I get ready it will be worth it! I can't schedule dates far out so I leave a deposit on hand for when he has a cancellation that fits my time frame. Captain Jim in my opinion is a first class guide. He will try his best to put you on a fishing trip of a life time. He supplies you with everything you need to fish with. His co-partner Belle is... read more a very loving dog. After a day on the water with the two of them you will have made a new friend. He is very knowledgeable of the lake and how to locate fish. If anyone has not used Captain Jim, please give him a call and book a memory to keep for ever. Wow! What an unforgettable day on the lake with Captain Jim, my 12 year old son, and Belle. 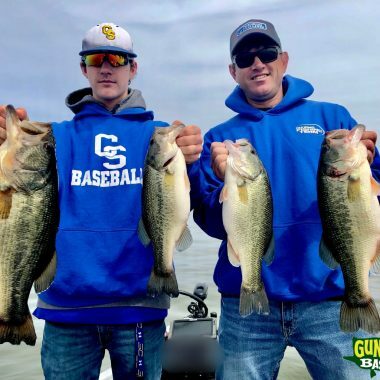 I blindly started a search for a bass guide for a mother/son fishing trip and I struck gold. 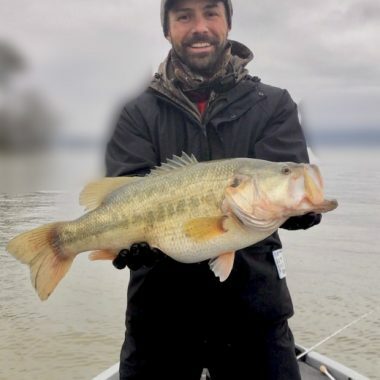 By some miracle, I... read more selected Guntersville Bass Guides and gave Captain Jim a call. He answered right then and had us booked in a flash. He answered all of my lodging questions and even helped me out with a list of recommended restaurants. What seemed like a huge ordeal suddenly got really simple with the help of Capt. Jim!